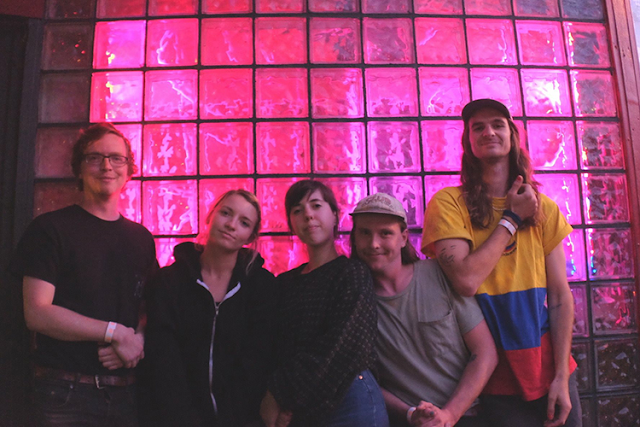 Why Bonnie (ATX) originally started as the bedroom recording project of Blair Howerton, and has evolved into a dynamic quintet including Kendall Powell, Sam Houdek, Mitchell Lamon, and Chance Williams. Why Bonnie's sound teeters between atmospheric dream pop and melancholic indie rock, with harmonic remnants of Fleetwood Mac and The Breeders. After releasing their first two EPs, In Water and Nightgown via Sportsday Records, they are soon to release their first full length album at the beginning of 2019. Blair: GoldflakePaint, Spotify, shows, friends. Chance: Snail Mail tour in early December and our first full length album release. Kendall: Kim & Kelly Deal or Annie Clark. Mitch: I’d love to find a Blaze Foley record. Mitch: Slow Burn by Kacey Musgraves. We could all take a little time to embrace the slow burn. Blair: Writing music is my most helpful coping mechanism. It gives me a chance to step outside of myself and rearrange my thoughts while simultaneously making me excited about life. Music is a nice reminder that the world's not all that bad. Sam: We have a new jam called Voicebox that floats in between super atmospheric & kinda harsh & dissonant & I really enjoy switching in between those two gears. Also, “Amber” by 311. Kendall: Paris, France - the romance!!! !